October 26, 2010 - The first S-70iTM Black Hawk helicopter has successfully completed production flight testing and will begin development and flight testing of options that will be made available to international customers. The aircraft has flown more than 50 hours in its production flight test program. It will undergo extensive flight testing in the coming months as options are integrated into the aircraft. ?The next phase of the program will expand the capability of the aircraft, transitioning it from a baseline configuration to a multi-faceted platform,? said Debra A. Zampano, S-70i Senior Program Manager, International Military Programs. ?The aircraft has performed to all program requirements and has made a smooth transition from its production build in Poland through Sikorsky?s rigorous flight test program in Florida. 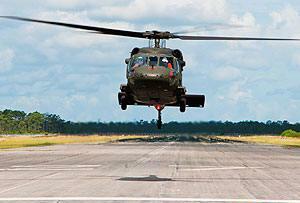 The next phase of development will produce a Black Hawk helicopter that the global marketplace has never seen before.? Peter Ladyko, Chief of Test for the S-70i helicopter program said, ?The aircraft has undergone a detailed ground and flight test program involving a number of systems, including dual exportable radios, exportable transponder, emergency locator transmitter, embedded dual GPS/INS navigation, and electromagnetic compatibility testing. We look forward to expanding the platform to incorporate additional options in the next phase.? The options that will be developed for the S-70i will enable customers to perform missions such as humanitarian relief, search and rescue, medical evacuation, command and control, and armed patrol. Deliveries to the launch customer of the S-70i helicopter program are slated to begin by mid-2011. The S-70i helicopter utilizes a global supply chain and is the first Black Hawk helicopter ever to be assembled in Europe. The aircraft are being manufactured at PZL Mielec, Sikorsky Aircraft?s company in Poland. The S-70i Black Hawk helicopter incorporates the latest technology with advanced features such as a fully integrated digital cockpit with a dual digital automatic flight control system and coupled flight director. It also features an active vibration control system that will smooth the overall ride of the aircraft. The dual GPS/INS system with digital map provides accurate and redundant navigation for the most demanding of tactical environments. Customers around the world will benefit from the aircraft?s modern, robust aircraft configuration and ability to leverage existing interoperability with Sikorsky?s worldwide fleet of Black Hawk helicopters.